Retired Air Force Capt. Chris Cochrane, left, accepts the 2016 Department of Defense Warrior Games torch from Navy Lt. Ramesh Haytasingh of the U.S. Special Operations Command team during opening ceremonies at the U.S. Military Academy in West Point, N.Y., June 15, 2016. With Haytasingh is his son, Tobias. The 2016 Department of Defense Warrior Games began in West Point, N.Y., when Army Capt. 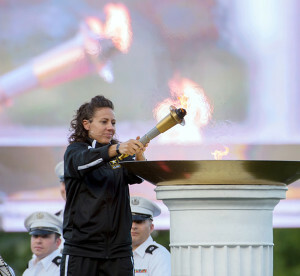 Kelly Elmlinger, with help from comedian Jon Stewart, lit the official torch during the event’s opening ceremonies at the U.S. Military Academy. About 250 wounded, ill and injured service members and veterans representing teams from the Army, Marine Corps, Navy, Coast Guard, Air Force, U.S. Special Operations Command and the United Kingdom armed forces will compete in shooting, archery, cycling, track and field, swimming, sitting volleyball, and wheelchair basketball June 15-21. During the ceremony, Stewart said he doesn’t come to support the wounded, ill and injured athletes but to get support. Comedian Jon Stewart, most notably of The Daily Show, poses for a photo with the Air Force team during the 2016 Department of Defense Warrior Games on June 15, 2016. Stewart emceed the opening ceremonies for the games. Stewart said he brought his 11-year-old son, Nate, so he could meet the wounded warriors firsthand. Stewart, who has done several USO tours overseas in combat zones, has also visited many times with wounded warriors at Walter Reed National Military Medical Center in Bethesda, Md. “I’ve seen what these individuals have to go through. 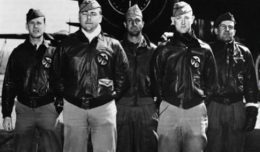 They have faced the worst that humanity has to throw at them, and they decided not to allow themselves to be defined by that act but to be defined by their actions following that act, their actions of getting up off that floor. I’ve seen the blood, sweat and tears they’ve gone through to get here, and the profanity. If you go to the physical therapy room at Walter Reed, there’s a lot of profanity,” he said with a smile. “They do it with pride and when they fall, their colleagues and their loves ones pick them up and don’t let them give up, so I applaud the families and the caregivers here today,” he added. Army Lt. Gen. Robert L. Caslen Jr., the Military Academy superintendent, said he was honored that the Academy is hosting the Warrior Games and quoted The American Veterans Disabled for Life Memorial in Washington, D.C.
“It says, ‘It’s not what you lost that counts. It’s what you do with what’s left.’ That’s what these games are all about,” he said. “We’re here to celebrate ability, to celebrate resilience and to celebrate the drive to overcome adversity. These games showcase the resilient spirit of these warrior athletes. They symbolize that all wounded, ill and injured service members and veterans can recover from serious injuries or illnesses and lead fulfilling, productive and inspiring lives. “As these warrior athletes take the fields of friendly strife, they will show the world their indomitable spirit, their sportsmanship, their desire to excel, their tenacity and most importantly, their strength of character,” Caslen continued. Caslen had a special message for the athletes, families and caregivers. As a special surprise, the Golden Knights flew in a plaque that medically retired Sgt. 1st Class Howard Sanborn, a former Golden Knights member and current SOCOM athlete, presented to retired Army Gen. Fred Franks, a Vietnam and Desert Storm veteran. Franks, who is a below the knee left-leg amputee, said he was very touched. Comedian Jon Stewart, most notably of The Daily Show, poses for a photo with the U.S. Special Operations Command team during the 2016 Department of Defense Warrior Games on June 15, 2016. “I was very moved and am deeply appreciative and inspired to be here to receive something like this on behalf of all my fellow wounded warriors and in the company of such great Americans,” he said. During Desert Storm, Franks commanded the 7th Corps, leading 146,000 U.S. and British soldiers in an 89-hour, 155-mile attack as part of the coalition that liberated Kuwait. Stewart encouraged disabled service members and veterans to give adaptive sports a try. Adaptive sports and reconditioning are linked to a variety of benefits for wounded, ill, and injured service members across all branches of the military. Benefits include less stress, reduced dependency on pain and depression medication, fewer secondary medical conditions, higher achievement in education and employment, and increased independence, self-confidence, and mobility. 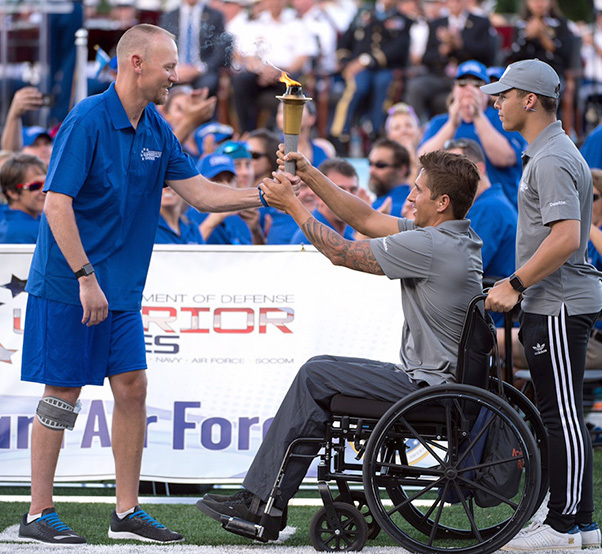 Admission to Warrior Games competitions is free and open to the public.